Why Do People Love Trivia ? - TriviaMatic! Why Do People Love Trivia ? Trivia games have become a principal way to entertain and reward ourselves for what we know. At first, the plan was to just give bars a way to get people in slow nights, but the concept of bar trivia turned into a phenomenon as the draw towards trivia seems clear today. But Why people love Trivia ? Why are they fascinated with this type of quizzes ? Discover it having an insight into the human psychology to define what gets people engaged in trivia quizzes. 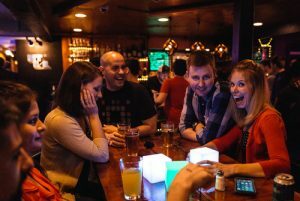 Trivia bar quiz is a unique invention that combines two obsessions : drinking and improving self-esteem. Drinking is what brings people together. It tastes incredibly refreshing, hydrates and shares good vibes. The other reason why people choose spirits is hidden in the sense of identity and community in a favorite local bar. Having a need for being right is a form of self-approval and the identity is dependent on people’s need to recognize their achievement. People want to think they are right and trivia bar quizzes come to assure that it serves this need. These two concepts are what promote trivia bar quizzes at bars. Bar quizzes fulfill the need for knowledge in society and they’re fun. It attracts a half dozen others out there in search of a fun night. Having all these factors encountered, customers get back week after week. You just need to download the TriviaMatic app and provide space for these two factors to act. Creating your TrivaMatic account is free, and you can opt for as many trivia quizzes or any other type of promotions as you need. A TriviaMatic subscription only indicates to join and run your business providing people with drink, make challenging trivia nights, have fun and make them recognize their achievement. BE SURE ! Knowing why people love trivia nights and keeping your customers feeling good will have its profit in promoting your business. Ever Imagined Sir Ian McKellan Joining Your Pub Quiz?